Getting Back Together with Cats – Your cat doesn’t come to you often lately? Seems like your cat avoids you…? There’s always a reason behind the action. Let’s take a look at 5 crucial steps, which make you and your cat getting back together. It does only harm you keep doing what you think is good to your cat. Stop doing what she doesn’t like you to do is the first step. It’s like you keep stepping on the gas while you stepping on a brake. It’s going nowhere and it can harm the relationship worse. It could be your deodorant cat don’t like, could be loud voice. You might wanna check out cats dislike. Sounds cheating? Your cat would come to you only when you give her a treat. But that’s the point. Let them know you are not her enemy, and who he gives a treat. It sets cat’s guard off. Make sure what you give him is what he likes. Someone talked to a feral cat everyday on the way to the office, the cat finally came to like him. He kept telling this cat You are so lovely. Each time he passes. This kind of thing happens very often. Even if you don’t spend much time nor giving food, cats remember someone who talks to them well. Just once may not mean anything, but if you keep on doing it every single day with a calm tone, cats came to like you. If the cats are less alert, you may be friends with her by now. Even a cat reacts not very much, keep talking to her. Cats can understand you care about her. What you say doesn’t matter, your action matter. Cats like to stay on higher ground. Especially they have spots above human head. They can relax there. 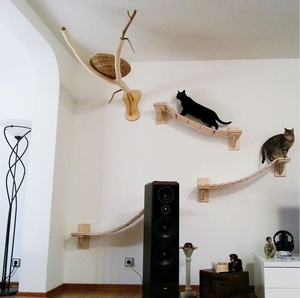 This is because cats can feel more powerful than human when they are in the higher spots. Cats who don’t trust human have a fear towards human. Putting themselves on the high spots gives them a kind of relief that they can’t be attacked or bothered. Once you realize you and your cat are on bad terms, there’s always a reason what you do or what you don’t do. Try to find out what caused the discord and do not hurry to solve the problem. How long would it take to get back together? Nobody knows. It may be a week, may be a month, may be a year or more. It can take longer than you think, but it’s worth the effort. We benefit a lot from knowing what you are doing is for the better relationship between you and your cat in a longer time period.